Africa needs engineering competences in problem solving, design and analytical thinking to overcome its socio-economic development challenges, former President Olusegun Obasanjo has said. "In many parts of Africa, young engineers have not been trained for specific roles in the industry. 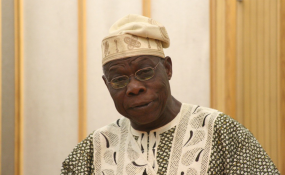 "We have to teach them to convert the technical knowledge acquired into useful artefacts needed in the industry," Obasanjo said at the opening of the 3rd African Engineering Deans Council (AEDC) summit on Tuesday. The News Agency of Nigeria reports that the summit held at the Covenant University, Ota in Ogun. The former president delivered a keynote address at the summit which had the theme: "Engineering for Socio-Economic Development in Africa". Mr. Obasanjo said that young engineers should also learn how to transform manufactured products into viable business ventures. "Let us have more engineer entrepreneurs rather than engineer job seekers," he urged. According to him, the engineering curriculum of the 20th century is no longer sufficient to address the engineering challenges of the 21st century. "UNESCO recognises the need to reform engineering education and support research to establish a baseline overview of existing best practices in engineering education in sub-Saharan Africa with special focus on student-centred learning," he said. He said that the emphasis on personal and professional attitudes by industries indicated that engineers were not only expected to be technically proficient but also to know how to behave and operate within an organisation. "In the time past, Africa carved an enviable niche for itself in the field of textile, maritime technology, architecture, medicine, telecommunications, commerce, warfare and others, where are we today? "Let me reiterate that my aim here is neither to romanticise the past nor bemoan it, but to use the past to help our present and inspire our future in socio-economic growth," he said. He called for more interaction between industries and universities to promote innovation and facilitate absorption of graduates by industries. The former president said that such a relationship had become a subject of great interest to even policy makers. "It will engender improvement and innovation in industry and help to ensure relevance in academic training and research," he said. Mr. Obasanjo, however, hailed African countries for embracing technology as a driver of development. He noted that telecommunications in particular had improved quality of life across sub-Saharan Africa. He charged the council to see how technology could be further harnessed to improve the standard of living in Africa. "According to Wikipedia, about 40 per cent of Africa-born scientists and engineers live and work in European countries. "Some call it brain-drain and often dwell solely on the negative implications, but have we seriously thought of how this can be of benefit to the continent?" He lauded the Chancellor of Covenant University, David Oyedepo, for vision and support for development of humanity. Mr. Obasanjo said that Mr. Oyedepo remained a true believer in the Africa project. In his remarks, Mr. Oyedepo praised the council for organising the summit and for efforts so far in seeking solutions to challenges to socio-economic growth of Africa. He said that he looked forward to seeing innovations by the council that would tackle a greater part of challenges facing humanity. The President of Guinea, who is also the President of the African Union (AU), Alpha Conde, called for a paradigm shift from the 20th century engineering to the 21st century engineering to facilitate Africa's development. Mr. Conde, represented by a Cabinet Minister in Guinea, Alpha Barry, said that the continent would move forward through science and technology. "Do not ask what Africa can do for you; rather, think of what you can do for Africa," Mr. Conde urged. The President, African Engineering Deans Council, Moses Obiazi, had in his opening speech said that Africans' access to shelter, water, sanitation and energy was vital for increased productivity. "To realise this, African engineers must be fully involved as it is only Africa that will solve Africa's problems. "Currently, we do not have specific policy framework to encourage and mobilise African engineers to collaborate in tackling Africa's infrastructure and developmental challenges. "AEDC is, therefore, poised to work through AU to help to foster collaboration in developing technologies, manpower, skill and competences required to tackle Africa's multiple challenges. "This will raise the bar of advancement for the continent," Mr. Obiazi said.